With the World Cup knockout rounds underway, it’s time for me to give an analysis of which team I think will hoist the Cup at Maracanã on July 13. Since I don’t know that much about soccer, beyond what I hear from my fútbol-loving friends and from the commentary on these matches, I decided to turn to one thing I do a bit about: data. Particularly that from the group rounds, since that gives us the most-recent information from the teams’ on-field play. Obviously, we could analyze the key particulars — wins, losses, draws, goals — and those would give us some moderately reasonable ideas of who might be coming in with a head of steam. But there’s a difference between Brazil’s 4-1 trouncing of hapless Cameroon (which finished with zero points) and France’s 5-2 blowout against Switzerland (which qualified as the group’s second seed). To account for that, I created two comparators. Weighted Points is the number of points awarded for each result (3 for a win, 1 for a draw) multiplied by the respective opponent’s final point-total. Weighted Goal Differential is the goal differential for a given game multiplied by the respective opponent’s final point-total. Since Switzerland finished with 6 points in its group — it beat both Ecuador and Honduras — France would receive 18 Weighted Points (3 points for win x 6 Swiss points) and a Weighted Goal Differential of 18 (+3 GD x 6 Swiss points). In that same game, Switzerland would receive 0 Weighted Points and would get a Weighted Goal Differential of -21 (-3 GD x 7 French points). Here is a table with each qualifier’s stats. Now, for the methods for comparison. I went with two. I used the first three determinants of standing in the group round (points, goal differential, goals for) and added my two weighted criteria. Whichever competitor “won” more match-ups would advance. I had one tie, between France and Germany in the quarterfinals. I gave the win to Germany based on its better weighted performance. Because I created the “weighted” scores to attempt to capture strength of schedule, I felt going with those alone would be a good test of their worth. I had two ties. I gave Costa Rica the edge over the Netherlands because CRC amassed fewer points in the opening round (and thus had less of a chance to rack up bigger weighted scores). 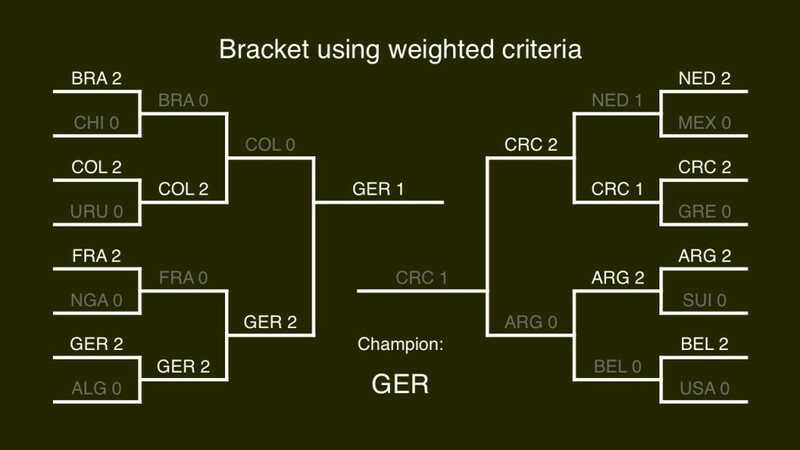 In the finals, I went with Germany over Costa Rica because they had better GD and GF data (they were square on points). Both models are subject to a very limited data set: just three games for each team. As such, they are not very reliable as a proxy for long-term success — particularly in a single game of soccer. The weighted criteria, paired with the small set, give an edge to the first-place teams in each group. Both models have all of the group winners advancing over the second-place teams. Colombia over Brazil in both. We saw Chile take Brazil to penalties (and almost won late in extra time). Maybe? I like the looks of the first model. 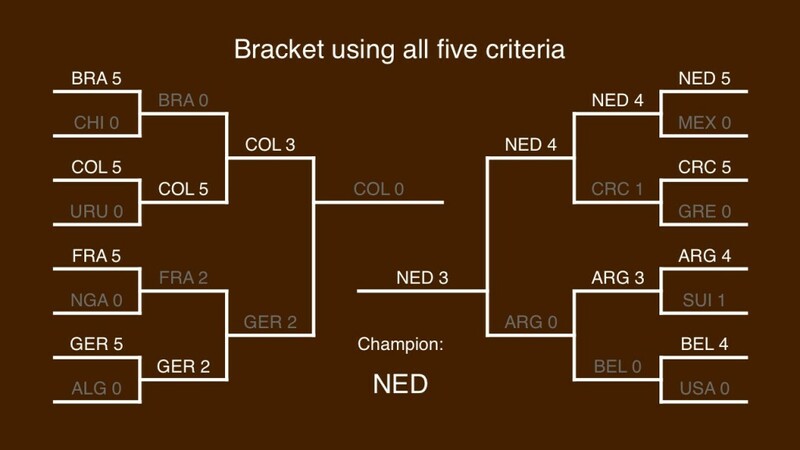 The second model (weighted only) is more questionable — Costa Rica in the finals? Seems a bit farfetched from what I understand. But then again, as we’ve seen in this Cup, anything is possible.